We supply a wide range of direct thermal and thermal transfer printers, supported by the widely known Bartender software, which Datamark highly recommend. This provides you with solutions ranging from handheld printers for use in warehouse applications or on the shop floor, to industrial 8″ wide label printers printing on a wide range of materials to suit your own individual applications. GoDEX’s portfolio of compact, but feature rich desktop label printers are ideal for situations that are tight on space, but require high-quality, reliable direct thermal or thermal-transfer printing. 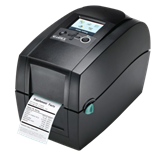 Engineered for ease-of-use, the RT Series of printers offer a broad range of connectivity options, making them ideal for countless low to mid-volume label, receipt or wristband printing applications. The G series introduces a product line for all your light to medium duty thermal transfer barcode printing applications. G500/G530 are equipped with “Twin-Sensor Technology.” These products are perfect for printing on all types of specialty materials especially for retail & industrial applications. Ideal for all situations that require high-quality, reliable direct thermal or thermal-transfer printing. Click to view the full ZX Range Brochure brochure. GoDEX’s portfolio of Industrial Printers are ideal for all situations that require high-quality, reliable direct thermal or thermal-transfer printing. EZ2250i/EZ2350i, EZ2000 Plus and the EZ Range Brochure. Click to view the full EZ6000+ products range brochure. The EZ series include GoDex’s most remarkable printer products with extremely high stability and durability. As a multi-purpose thermal transfer desktop barcode printer it is suitable for product labelling, packaging labelling, printing retail labels and tags, hospital and recreational wristbands and other small, temporary labelling applications. Plus they come equipped with advanced features which are ready for your most demanding jobs, e.g. User panel with backlit LCD display for easy-user-interface and operation. Options include: WLAN interface, CF memory adapter with real time clock, rotary cutter, label dispenser, external label roll stand, & external rewinder. So click to view the full EZ products ranges.